Mary Kom is an Indian Olympic boxer who hails from the North Eastern state of Manipur. Mary Kom is a 5-time World Amateur Boxing Champion, and the only woman boxer to win a medal in the six world championships apiece. In 2012. Mary became (and remains) the only Indian woman boxer to qualify for the Summer Olympics when she competed in the London Olympics. She went on to clinch the bronze medal in the 51 kg flyweight category. As of November 2018, Mary Kom is ranked as the No. 1 boxer in the women’s 45-48 kg category with 500 points along with Russia’s Paltceva Ekaterina. Kom is also the first Indian woman boxer to earn a Gold Medal at the Asian Games (2014 in Incheon, South Korea) and at the Commonwealth Games (2018 Gold Coast, Australia). Kom is also as a member of the Rajya Sabha after being nominated by the President of India on 26 April 2016. Mary is an active supporter of wild animals. Mary Kom’s rise to the top of women’s world boxing is anything but a straightforward one. Mary was born to Tonpa Kom and Akham Kom in a small village of Kangathei, Manipur. Manipur is one of the backward regions of the seven North Eastern states and in those days, it was a strife-torn state. Mary Kom grew in the midst of poverty and famine. She had the quality of being responsible from the start itself, as she took care of her three younger siblings. Her parents, who were peasants and toiled in the fields of Jhum. Kom was very much interested in playing different sports during her schooling days. She started off by participating in the various athletic competitions mostly related to Discus Throw and Shot Put. 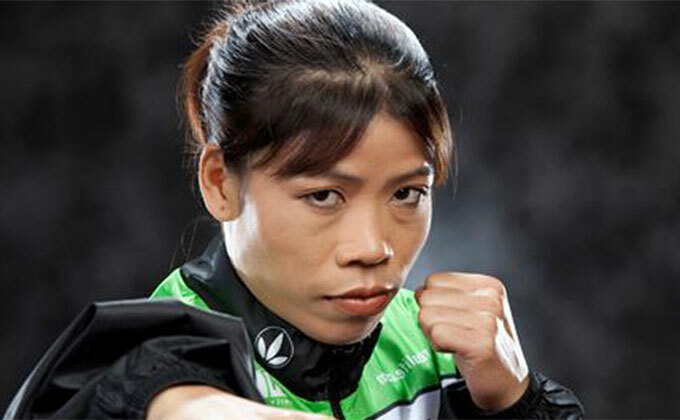 However, she started following a famous Manipuri boxer Dingko Singh and soon took up picked up the boxing gloves. However, boxing was a thing that her parents, especially her father, Tonpa Kom, despised the most. Their reason – Boxing is a male sport. He felt marriage would indeed reduce Mary’s chances of finding an able groom. The irony was Tonpa was himself an ex-sportsperson. He used to play wrestling during his heydays before resorting to farming due to economic conditions. However, all the resistances made Mary stronger and more resilient by the day, the qualities of utmost importance for any boxer. By fighting against all odds, Mary proved that boxing was indeed in her blood. To aggravate her problems, Kom did not receive proper gears to sustain her training. As a result, she would often indulge in professional street fighting among other means, to support her training. No attempts from her parents or challenging circumstances were enough to keep Mary away from her passion ever succeeded. Mary Kom Prevailed. 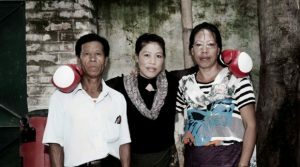 Her first coach was K. Kosana Meitei, who taught her the basics of boxing. 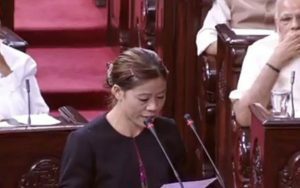 In 1998, a 15-year-old Mary Kom made an all-important decision that would change her life forever. She decided to move to the Sports Academy in the state capital Imphal. 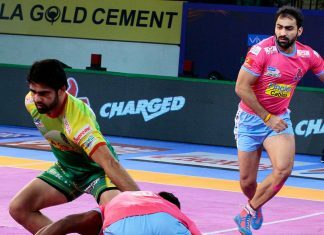 There, Mary would meet Narjit Singh, the state coach, who would have a big impact on her career. In their first interaction itself, Singh sensed the burning desire in Kom and decided to take her under his aegis. He almost instantly knew that Mary held the kind of boxing potential to make the whole country proud of her. Soon, Kom participated at the State Boxing Championships, where she won the gold medal. The next day, it was the moment when Tonpa saw his daughter’s image in a local newspaper that he decided to finally support her. With her sire’s support now with her, Mary set out to conquer the world. Mary Kom competed in her first international event at the World Championship’s debut season in 2001. In the first-ever boxing competition on that scale, she managed to clinch a silver medal in the 48 kg category. She bettered her performances in the following year as she went on to win a gold medal at the 2002 World Championship in Antalya. She doubled the joy by winning another gold at the Witch Cup in the pinweight category. Kom won the boxing gold in the 2003 Asian Boxing Championships at Hissar. 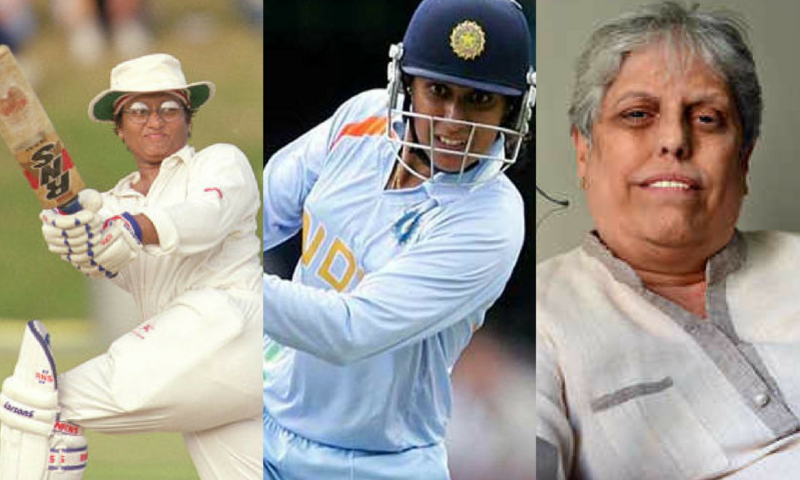 That year, the Indian government also bestowed the Arjuna Award upon Mary Kom. The year 2004 was relatively silent, with the Manipuri boxer winning only the 2004 Boxing World Cup in Norway. In 2005, the Manipuri boxer bagged the 2005 World Boxing Championship Gold at Podolsk before winning another Gold at the Asian Boxing Championships at Kaohsiung. 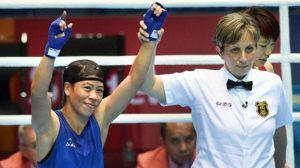 After Mary Kom became a legend of sorts in the women’s boxing as she pocketed a hat-trick of World Championship titles in 2006, the demands for a Rajiv Gandhi Khel Ratna started to become vehement. However, a trio of gold medals at the highest level was insufficient to convince the jury. She was again ignored in 2007 when she had won her fourth title at the Worlds. However, the then sports minister, M.S.Gill made an intervention and promised to do justice. He played an instrumental role in helping Kom earn the Khel Ratna. In the meantime, Mary Kom had the tied knot with her love interest, K. Onler Kom in 2005. She had met Onler in Delhi in 2001 when he was working for the Kom community’s welfare. The couple gave birth to the twin sons, Rechungvar and Khupneivar. However happy her new family was, the new members needed her support, which is why she had to take a break after their birth. Mary would often be distraught over lack of action in her life. Her husband Onler had an important role to play during this time of inaction. He took the lead to stay at home and look after their newborns full-time. With her husband’s strong support with her, Mary came back from a two-year sabbatical in a rousing fashion. In the next two years that followed she won the World Championship twice. In the form of her life, Mary faced a big dilemma going into the London Olympics – She had to compete in the 51 kg category because of the fact that Olympic governing body deciding to play only 3 boxing categories. This proved to be a major challenge for Kom, having played in the 46 kg class for the better part of her professional career. Her problems were further exacerbated after her coach, Charles Atkinson was not allowed to join her at the Olympic Village, as he was not an International Boxing Association (AIBA) 3 Star Certified coach. Nonetheless, Mary made a good start to the campaign, with wins over Poland’s Karolina Michalczuk, Maroua Rahali of Tunisia on her way to the semi-finals. However, in the semis, she faced the biggest challenge in the face of a 30-year-old English boxer – Nicola Adams. Adams was the Mary Kom equivalent in the 51 kg class and had won the European Union Amateur Championships and the 2011 European Championships coming into the event. As expected, the Leeds-born had a clear weight advantage over her Indian opponent. Mary gave her best, but could not overcome Adams as the match ended at 6-11 and she had to settle for bronze. While Adams would go on to win the gold medal by crushing China’s Ren Cancan by 7-16, Mary became the first Indian woman boxer to win a medal at the Olympics. Mary’s years post the Olympics were very eventful. She won the 2014 Incheon Asian Games Gold in the flyweight category. 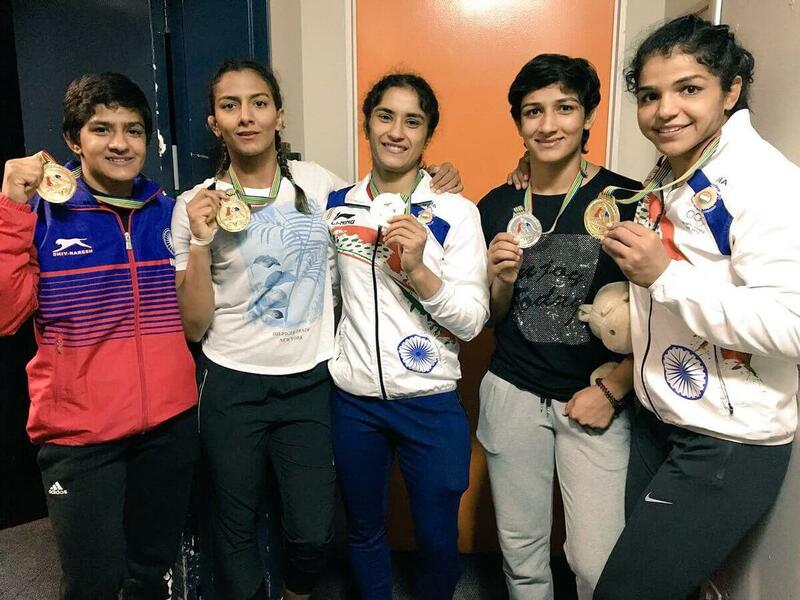 Then, in 2017 she bagged an unexpected fifth gold medal in her usual 48 kg class at the ASBC Asian Confederation women’s boxing championships at Ho Chi Minh in Vietnam. As she aged, she seems to get better in the sport. In 2018, at the age of 35, she was the oldest Indian boxer to win a gold at the 2018 Gold Coast Commonwealth Games – A medal that had eluded her for so long. The win was especially noteworthy as it had come after another hiatus of two years which had seen Kom been elected as a Rajya Sabha member. She had last boxed in a competitive match in the 2016 Rio Olympics qualifiers. After her Commonwealth games triumph, Kom also expressed her eagerness to win a gold at the 2020 Tokyo Olympics to end her illustrious career. Mary Kom was born to Tonpa Kom and Akham Kom on 1st March 1983. She also has three younger siblings. Mary got married to Onler Kom in a grand ceremony in 2005. The couple has twin sons from the marriage. 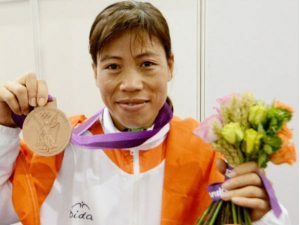 According to a report, Mary Kom’s earnings post-Olympics was estimated to be close to Rs 3.32 crores, with the Manipur and the Rajasthan state governments both offering Rs 50 lakhs for the Olympic bronze medal winner. Most of her income was from tournament earnings and brand endorsements. According to DNA, she was paid Rs 25 lakhs for the 2014 Priyanka-starer biopic titled ‘Mary Kom’. Recently, Kom was named as the brand ambassador for BSNL for two years. The International Boxing Association (AIBA) announced Mary Kom as the brand ambassador for 2016 AIBA Women’s World Boxing Championships.